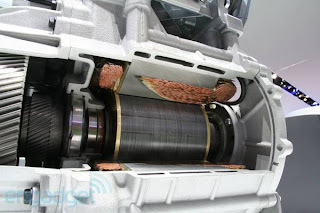 The folks over at engadget posted some close up pictures of a cut-away display version of the electric motor destined for use in the Ford Focus EV launched at the Consumer Electronics Show in Las Vegas this week. We forwarded the story to twitter and would have left it at that but the information published about the transmission is so wrong we need to run a correction. 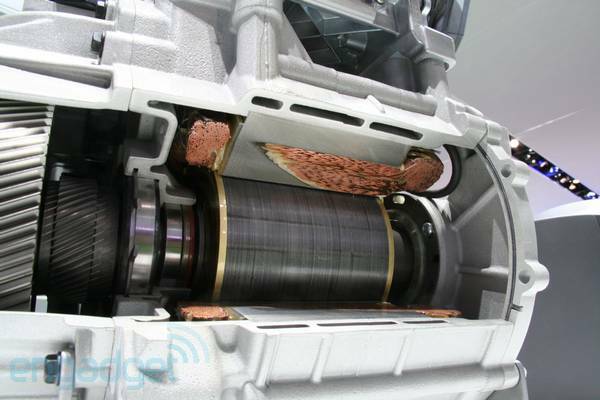 Amazingly, after all the gushing about the Focus EV at the launch, Ford haven't published any tech specs on the electric motor. The specs given for the Focus EV mule that appeared on the Leno Show back in September 2009 were for a 105 kw Permanent Magnet motor with 320 Nm. 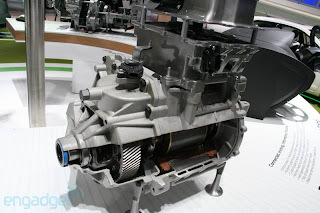 The motor and transmission pairing in the Ford Focus EV is very different to that used in the Ford Transit Connect electric van built by Azure dynamics. Again the press releases about the Transit avoid mentioning a power figure, but we do know the electric van uses a Siemens 3 phase AC motor that outputs up to 235 Nm peak through a Borg-Warner 31-03, single-speed reduction gearbox with a fixed ratio of 8.28:1. 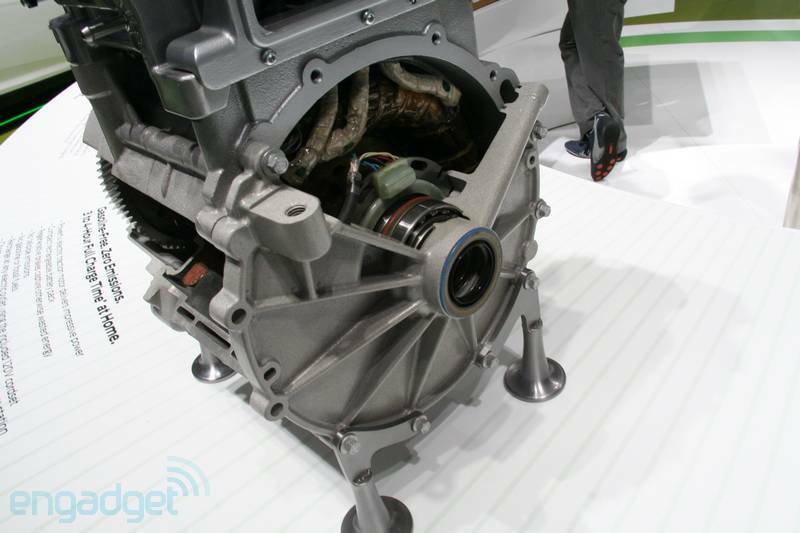 Based on the pictures taken by engadget of the trade show display motor, the Focus EV has a very different layout that harks back to the early 90s when Ford sold Ranger EVs in California. The arrangement used in the Focus is called a coaxial motor. 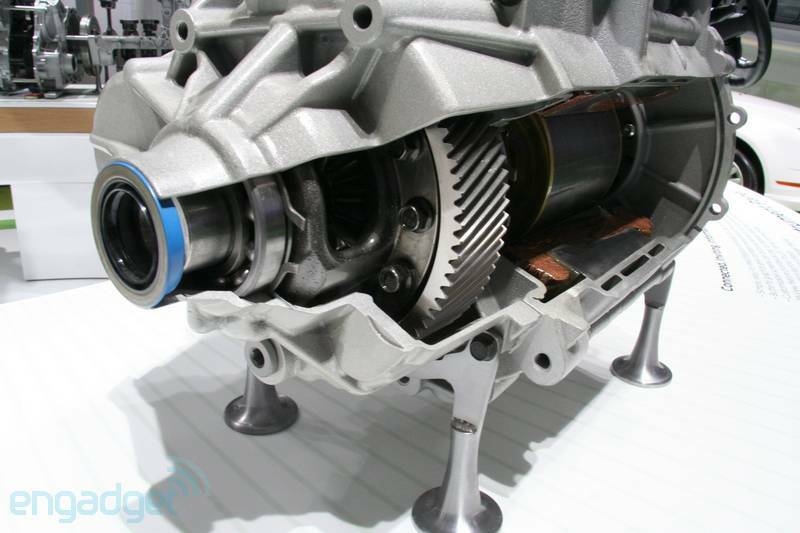 The differential is in line with the hollow electric motor shaft and this allows the longer of the two drive shafts to pass through the center of the motor giving a very compact under hood layout. 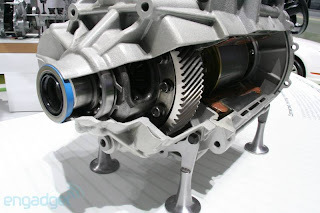 Please disregard any comments made in the engadget post about 2 speed transmissions in the Tesla Roadster and CVTs in the Focus EV as the production version of the Ford Focus EV will run a fixed single gear ratio like all current EVs.